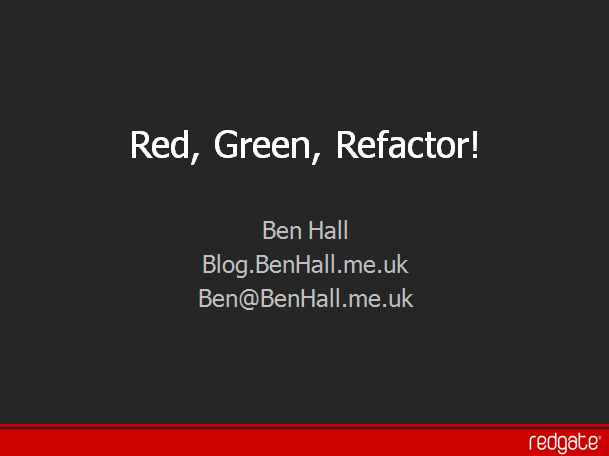 Tonight, I gave my Red, Green, Refactor session to NxtGenUG Coventry. It was great to return to my ‘home’ user group and give the presentation. The session was similar to the one I had presented at DDD Ireland and DDD Scotland with a few minor tweaks in places. Below, please find my code and slides. If you have any more questions, then please email me. 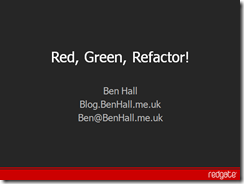 For now, this session will go onto the back burner, but if any user groups fancy a test driven development session then please give me a shout! Next Next post: GTA IV too dark?